COMRADES Interview on a Live Broadcast from Action24 TV network! 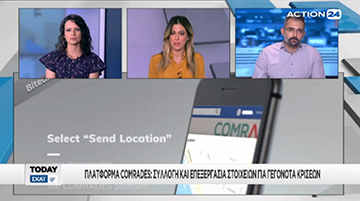 Vassiliki Zalavra and Pantelis Kanellopoulos, COMRADES partners from Gov2u and responsible for the project’s external communication and visibility, were invited at the TV news show “Today” by the journalist Ms. Maira Barba to talk about COMRADES project and its innovative platform. The live broadcast interview was featured on Action24 TV channel at national level. 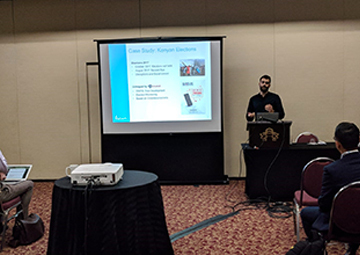 Our partners Vittorio Nespeca, Kenny Meesters and Tina Comes from the Delft University of Technology, presented the paper “Evaluating Platforms for Community Sense making: Using the Case of the Kenyan Elections” at the 15th ISCRAM Conference. The conference was held at the Rochester Institute of Technology in NY, USA from 20th to 23rd of May 2018. 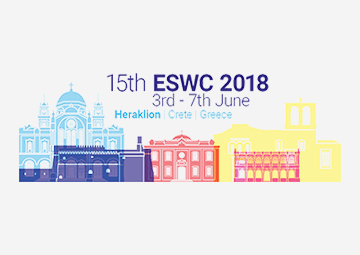 Our partners Prashant Khare, Gregoire Burel, and Harith Alani from Knowledge Media Institute, published a paper under the title “Classifying Crises-Information Relevancy with Semantics” which was presented on the 5th of June 2018 at the 15th ESWC conference. The conference was held at Heraklion (Crete Island) in Greece from 3rd to 7th of June 2018.